When I realized I was going to be having kids just 20 months apart, I realized that I was in for an adventure. 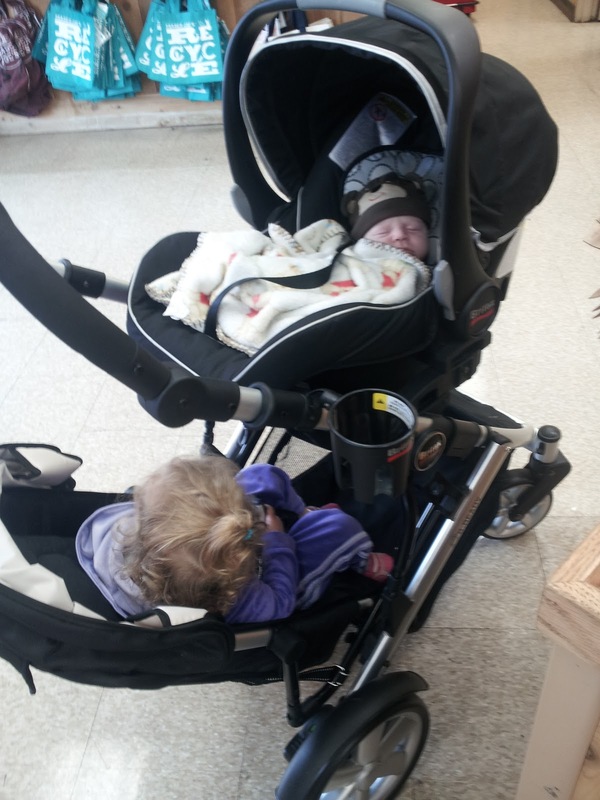 I also realized that I would need a double stroller since kids under two years old are not to be trusted to walk around on their own, or be able to walk long distances which is necessary when you love walking for exercise and that I live in a community with an eruv to allow Shabbos walks. Luckily, or unluckily, there are less double strollers available compared to the almost limitless amount of single strollers on the market, so the choices are narrowed down to a few. 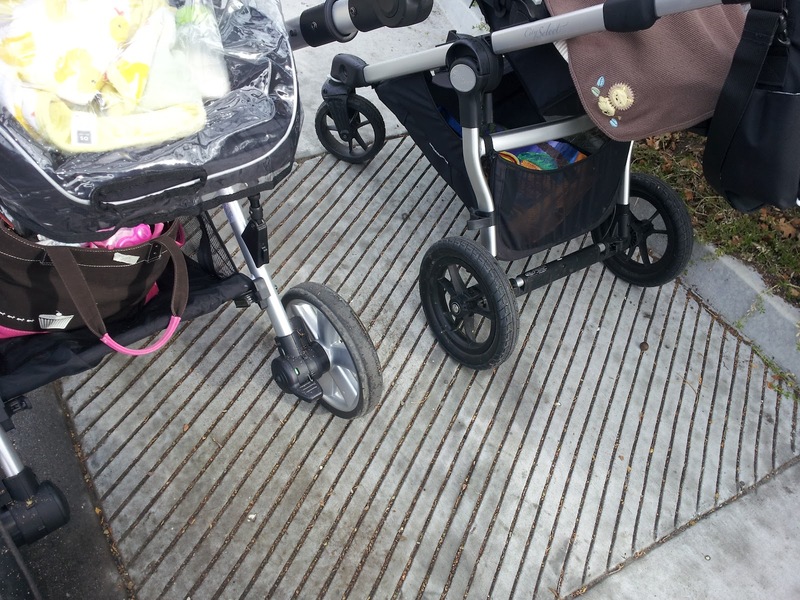 Additionally, double strollers are either side-by-side or tandem (front-back). For whatever reason, and I thank him for it now, my husband insisted against side-by-side strollers. He felt they were so bulky, difficult to maneuver through small spaces and inconvenient. While I do think a side-by-side jogger with air filled tires probably has the BEST push of all doubles, it wasn't really an option for us considering we drive cars, not vans or SUVs and do not have a garage to store big strollers in. We were very intrigued by the idea of a modular stroller, that is, a stroller that can be either a single or a double. Additionally, my husband insisted that we buy a convertible stroller and sell our single (my beloved Bumbleride Indie) to only have one stroller for both kids. After doing hours and hours of research we decided to go with the Britax B-Ready Stroller, Black . I will discuss why I like it, and the things about it I dislike or that I would change. The Britax B-Ready was released in late 2010 so it is relatively new on the market. It can be used as a single with a bassinet (sold separately) a car seat (sold separately) or the included toddler seat made for 6 months+. Additionally a second seat can be added which can accommodate a child from birth to 35 pounds or a lower car seat adapter bar can be added to allow baby to ride on bottom or for people with twins who need to accommodate two car seats. My LO is only 2 months right now so I have been using the stroller with the car seat on top and my toddler daughter riding on the bottom. The second seat comes with adapter extenders which can be used with a rear facing car seat or bassinet to give more room for the toddler riding below. Although my newborn can technically ride on the bottom with the seat reclined, I felt more comfortable having him on top and having him face me. Once he gets a little older, maybe 4 month, and can sit partially reclined, I plan on moving him to the bottom seat with the obstructed view, and letting my 2 year old sit on top where she can see the world to her heart's content. The top seat accommodates a child up to 55 pounds. While he is still in his infant car seat, I will probably continuing placing him on top whenever we are "on the go" because it is much faster than strapping two kids out of their car seats and into a stroller. A note on its versatility. Since my older child goes to playgroup most mornings, I am often with the baby alone. Well, I am SO thankful that I have a stroller that can be a single or double because if I just had a double like the City Mini Double I would be going on walks with only one child in a double stroller!!! I just snap the car seat in, and go. BTW I decided against buying the bassinet because I felt he would grow out of it in such short time. Instead I invested in a new car seat (the Britax B-Safe) because it integrates perfectly with the stroller. Also, My tiny Snugride 22 did not fit properly in the car seat adapter (its made for Snugride 30 and other models) and I decided to get a car seat with adjustor straps anyway to make traveling safer and to make it easier to take him in and out of the seat. Also, a few afternoons I was able to walk with just my toddler while my babysitter watched my baby. It was great having that option to easily switch the seat with the "Click & Go" system. The Fold - The stroller can be folded with the toddler seat in forward facing mode, without a seat on, AND with the second seat attached! That is an amazing feature because it saves time when getting in and out of the car. However, it is EXTREMELY heavy to lift when both seats are attached. I have no problem lifting the stroller alone or with just one seat attached, but both seats attached gets a little crazy I think weighing over 30 pounds. As I'm using it now with the car seat, I either have the double seat on or off so it is really manageable. Also, I am able to fit it in the back of my Pontiac Vibe which has a pretty small cargo space, and still have room for other bags and groceries. I was concerned about fitting other doubles since I do not have a minivan. Accessories: It came with a great cup holder, a rain cover for the main seat, a cool storage bag that can be used in singles mode and Click & Go adapters which make the Britax Chaperone Infant Car Seat able to just Click in. Now I want to talk about what I dislike. The biggest adjustment from my wonderful Bumbleride Indie single, was the difference in weight and the lack of air tires. My Indie only weighed a little over 20 pounds and it would just float around. It was so easy to bump up and down my stairs. The B-Ready is like a behemoth comparatively. It is HEAVY, it is huge. And the strange cheap wheels they put on it could really be improved. COME ON Britax, get with the picture. Your big competitor the Baby Jogger City Select has FOREVER AIR TIRES. Whenever I see them on my friend's stroller I practically drool. I would even buy them as an upgrade. HELLO more accessory money. PLEASE develop them Britax!!! It would make the stroller almost perfect. The handle is adjustable instead of telescoping. Not a huge problem because it gets tall enough and far out enough that I never kick the back of the stroller even in doubles mode. Interestingly, the BJCS has that rear axle bar which can be kicked, where as the B-Ready does not. Also side-by-side with my friends the B-Ready handle goes as far out as the City Select and even has a slightly taller setting that is slightly shorter in length which I prefer to use at 5 foot 8 inches tall. Compared to its rival the Baby Jogger 2011 City Select Single Stroller, Onyx The stroller is easier to steer in doubles mode than the BJCS because the second child rides rear and not over the front wheels. The BJCS can fit two kids to 45 lbs so it might be better for twins, but I think B-Ready is perfect for kids of two different ages. BJCS has forever air tires, B-ready has some weird foam tires or something... sketchy. BJCS has technically more configurations since you can put a bassinet on the bottom etc. I think the BJCS seat reclines flatter than the B-Ready but the seats are both rated for 6 months +. Both Strollers sell the bassinets separately. Britax B-Ready is cheaper! $339 on amazon vs. $499 for BJCS. The 2nd Seat for the B-Ready is only $101 on Amazon Britax Second Seat for B-Ready Stroller, Black now but the Baby Jogger 2010 City Select Stroller Second Seat Kit, Onyx is $159. That adds up to a difference of $220 more to buy the BJCS when buying the strollers for doubles mode. In Summary: I am able to steer the B-Ready one handed when loaded with both kids at the supermarket while dragging a cart behind me. That alone, is priceless. If you are looking for a full-feature, convertible double stroller with multiple options for configurations with a great push than the B-Ready is a great option. I think it is priced at a good value compared to its competitors. Britax customer service has been amazing and has already sent me replacement parts for a few things which were not to my liking. There is a one year warranty. My only criticisms would be over the stroller heaviness, the lack of forever air tires and that the storage pouch is hard to attach in doubles mode. Also, why not design for the main seat to recline completely flat so that a newborn could sit in it? I still miss my Bumbleride Indie single which I sold on Craigslist, but I have no problem using the B-Ready as either a single or a double and it is working out nicely for us. Hi. What replacement parts did you get which we're not to your liking? What were the replacement parts for a few things which were not to your liking? I needed a new frame because our wheel axles were bowing out and it "gave" too much against handle pressure. The mudflaps warped, and a new seat because the regular straps were too short for a large child.